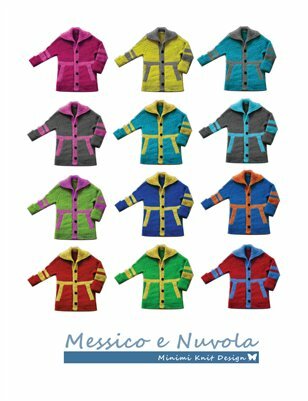 Messico e Nuvola is a cute jacket with contrasting color trims and pocket details for boys and girls. As a top-down jacket it is easy to adjust length to fit any child. Worked in a bulky but buttery soft yarn, this jacket will keep your child warm but yet allow freedom of movement. The fold back cuffs give it plenty of growing room. Have fun in picking the colors with your kid! Pamphlet / 8.25" x 10.75"